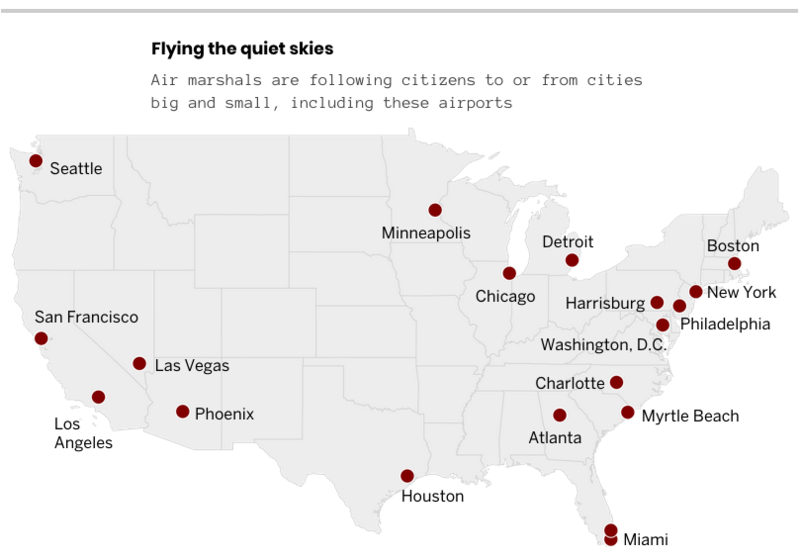 “Already under Quiet Skies, thousands of unsuspecting Americans have been subjected to targeted airport and inflight surveillance,” the Globe reports, citing documents and people within the department. The program, which launched in March, uses armed federal air marshals to covertly monitor how U.S. citizens behave on commercial domestic flights. The undercover marshals are required to take “notes on whether travelers use a phone, go to the bathroom, chat with others, or change clothes.” In their reports to TSA, marshals may “document whether passengers fidget, use a computer, have a ‘jump’ in their Adam’s apple or a ‘cold penetrating stare,’ among other behaviors,” according to the Globe‘s review of agency records. “All U.S. citizens who enter the country are automatically screened for inclusion in Quiet Skies—their travel patterns and affiliations are checked and their names run against a terrorist watch list and other databases,” the Globe reports.